Coming in a variety of sizes, eaten by most, and commonly available in almost every country around the World, the egg is essentially made up of 6 main parts: the shell, membranes, albumen or white as it is more commonly known, yolk, chalazae (the supporting tissue that ‘holds’ the yolk in the centre of the white) and the germinal disc or egg cell. ‘About Eggs‘ tells you everything you need to know about the inside of an egg. The shell is usually more pointed at one end. There is a good reason for this, when an egg is laid, if it rolls, it doesn’t roll away too far from the nest, because it rolls around in a circle! Not all eggs are like this, (the Pekin Duck for example) but in the wild, this is a useful feature, especially if you are a seagull laying your eggs in a nest on the edge of a cliff! The majority of the egg shell is made up of calcium carbonate, hence the need for us to provide a constant supply of calcium through proper nutrition and a good supply of oyster shell grit. Shells are porous and during incubation, this allows a certain amount of moisture to evaporate from the egg and also allows oxygen into the egg and carbon dioxide out of the egg for respiration. Shells are amazingly strong but in the right way. The inside of the shell is softer than the outside which means a little chick is able to break through the shell to get out but is well protected from the outside. This inner layer is also the calcium source that a chick uses to develop bones. There are two membranes: an inner and an outer. The outer membrane is attached to the shell. The inner membrane separates from the outer one at the broad end of the shell as the egg gets older creating the air sack. It is possible to gauge the age of an egg by looking at the size of the air sack using a bright light to ‘candle’ the egg. Freshly laid eggs have no air sack. Once they have cooled, the air sack measures about 3mm. The maximum allowable air sack size for Grade A ‘fresh’ eggs for the shops is 6mm. 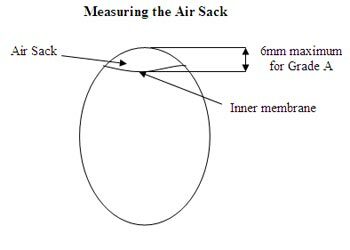 This is measured from the top of the egg to the inner membrane as shown in the diagram. The albumen or ‘white’ as it is more commonly called contains water, vitamins, minerals and protein. It has 3 layers: the first, next to the outer membrane, together with the last layer, next to the yolk are ‘watery white’. The middle layer is thicker like a jelly which acts like a shock absorber when the egg is knocked. The yolk floats freely in the inner watery white. The white is the food that is absorbed by the developing embryo in the egg. The yolk is made up of water, vitamins, minerals, fats and protein. This food is absorbed by the chick through the abdomen before hatching and keeps the chick alive during those first few days of its life. This is the reason that day old chicks can be shipped around the country and why chicks can successfully be left to dry out in the incubator without food or water for some hours before removing them to the rearing area. These are supporting spirals that hold the yolk in place. Each spiral is twisted in the opposite direction to the other. This is the part where the male and female cells meet in fertile eggs and start the cell division process.